Similar game to soccer dates back to China, and 2nd century. Where was the first soccer ball kicked with purpose to score? 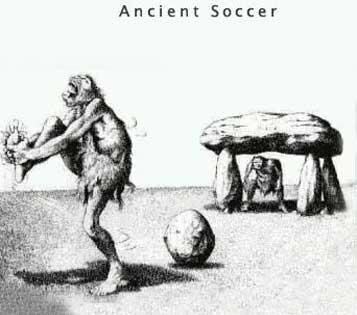 Nobody can be too sure where the soccer ball was kicked first, but there are many Countries and Empires throughout history, that played similar games to the soccer we know and love today. The question where this game originates from is really unknown, however it is documented where soccer as an organized game comes from (more on that later). Game similar to soccer was played in China, with the game called Cuju. As we travel back in time, to China 2nd Century BC, game called Cuju was played, using a round ball made out of leather. Points were scored by kicking the ball through a hole hung in between two poles, hung 30 feet above ground. Similar games, where the goal is to kick an object on the ground, was seen during the Middle Ages. This is also the time period where some organization came to the game, when different Villages, Schools, or Families started forming teams. Teams were formed by as many players as villages, or families could gather, with no limit to the number of players on the team. Games had no rules, causing the game to frequently end bloody, and violently. Try and picture two Villages playing against each other with no player limit. If you pictured chaos, blood, broken bones, and more chaos, than you pictured it right. Game resembling Soccer was so violent in England at one point, that it was banned in 1315 by Nicholas de Farndone, London Mayor at that time. HISTORY OF soccer as an organized game? England wrote the first set of rules, still used in the game today. First somewhat organized game of soccer was played by Schools. Different Schools played against each other, with rules decided by both teams. Soccer as a modern game seen today originates with the first Laws of the Game, written in 1863 at a Freemason's Tavern, located in London. Laws of the Game brought order and organization to this physical game. FIFA Laws of the Game are the Constitution of Soccer, written over 150 years ago, and followed to this day, with small rule modifications over the years to make the game better. What Country started soccer as a modern organized sport? Where, and When soccer originated as a modern game we see today? It all started at a Freemason's Tavern, in London, England (1863). More detailed explanation on the origins of soccer visit, World Soccer - Who Invented Soccer?